North Carolina's Urban Search and Rescue Regional Response system provides a quick disaster response for locating and rescuing victims. The Urban Search and Rescue (USAR) Program began in 2001 to respond to every kind of disaster -- anywhere at any time in North Carolina. Statistics show that 90% of victims of disaster are saved within the first few hours of an incident. Regional USAR teams provide almost immediate relief to the victims and the communities they live in through rapid deployment of properly trained and equipped search and rescue personnel. All training and equipment for the USAR Teams is standardized across the state. 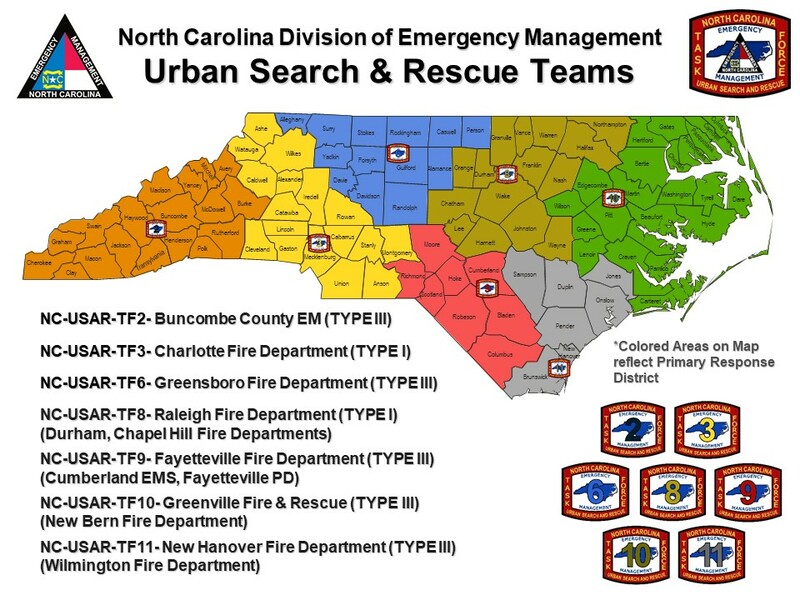 North Carolina maintains seven regional Urban Search and Rescue Taskforces in the state. At a minimum, teams maintain set skills, training, equipment, and capable personnel to respond to a wide array of disasters. Based on the location and type of incident, the State Emergency Operations Center identifies the nearest and most appropriate resource to deploy. 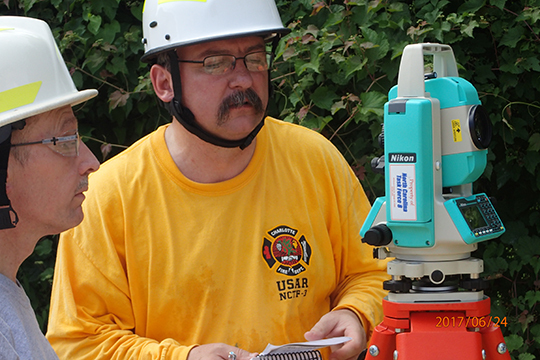 Under the direction of North Carolina Emergency Management, Urban Search and Rescue teams help communities that have been overwhelmed by the effects of natural or manmade disasters and have exhausted local and neighboring jurisdiction's resources. NC Urban Search and Rescue taskforces do not take over the scene, but work to support the needs of the local incident commander in providing anything from just technical support to a full taskforce response. Based on the location and type of incident, the State Emergency Operations Center will identify the nearest, most appropreiate taskforce to deploy and assist. The amount of personnel and scope of the event determines the number of teams deployed. The hosting agency is responsible for the staffing of the team personnel and they are also required to manage and absorb the costs associated with deployment pending reimbursement from the state. Taskforce personnel will be available to be deployed 24 hours a day, 365 days a year. Each taskforce maintains a sufficent personnel roster to deploy from initial notification within four hours. In the event of a prolonged or large-scale disaster, multiple taskforces can work on an operational rotation to support the sustained response requirement. If the incident is larger than local capabilities, including skills, training, and equipment, a call for assistance can be made to the State Emergency Operations Center. NC USAR taskforces each have an extensive equipment cache with highly specialized rescue equipment and personnel with just as specialized training. Taskforces also have access to specialized subject matter experts in various specialties such as heavy lifting and moving, building collapse engeeniring, and technical as well as wide area search. Charlotte Fire Department and Raleigh Fire Department provide the main training centers for North Carolina USAR teams because of the world-class training facility and the FEMA-qualified instructors located there. All training and equipment for the USAR teams are standardized. All team members receive 100 hours of initial training in Structural Collapse. Other specialized, position specific training is held throughout the State by qualified instructors. USAR Teams come from fire, law enforcement, rescue, and EMS agencies, both paid and non-paid professionals. Personnel must meet all training criteria as set forth by the Division of Emergency Management and be rostered by the sponsoring agency. The Division of Emergency Management does not manage membership on individual taskforces, as that is done by the sponsoring agency. Assessing the immediate structural condition of the affected area of Rescue Team or Task Force operations, which includes identifying structure types, specific damage and structural hazards. Recommending the appropriate type and amount of structural hazard mitigation in order to minimize risks on site to rescue team or task force personnel. Cooperating with and assisting other search and rescue resources. Monitoring assigned structures for condition changes while rescue and recovery operations are proceeding. Assuming an active role in implementing approved structural hazard mitigation as a designer, inspector, and possibly a supervisor. Coordinating and communicating the structural related hazard mitigation with IST Structural Unit Leader or Incident Commander. Accountability, maintenance, and minor repairs for all issued equipment. Adhering to all safety procedures. To receive technical assistance or request Urban Search and Rescue resources call the NCEM Emergency Operations Center at 919-733-3300.